Mary Hunter WATSON was born 12 July 1897 at 14 High Street, Paisley, Renfrewshire, Scotland. She was the sixth child of Thomas WATSON and his wife Jane MUIR. As their second daughter she was named according to the Scottish naming pattern; Mary HUNTER was her father’s mother. At the time of her birth her father was a dairyman, perhaps for a larger farm nearby Paisley. 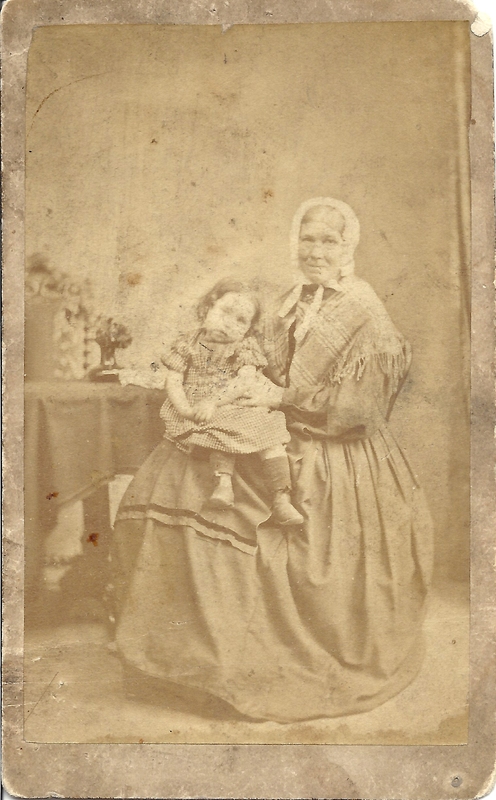 Photo left: believed to be baby Mary Hunter Watson on the lap of her paternal grandmother and namesake Mary Hunter. While positive identification has not been made, I believe that based on the cause of baby Mary’s death (below) it appears that her spine may have been twisted. And I believe that a photograph of the two Marys is something that the Watson family would want to have and keep. Based on the photo of Mary with her grandmother I believe that she was born with a curvature of the spine, which led to her fatal condition in 1900. The death of baby Mary was a tragic loss to the Watson family.